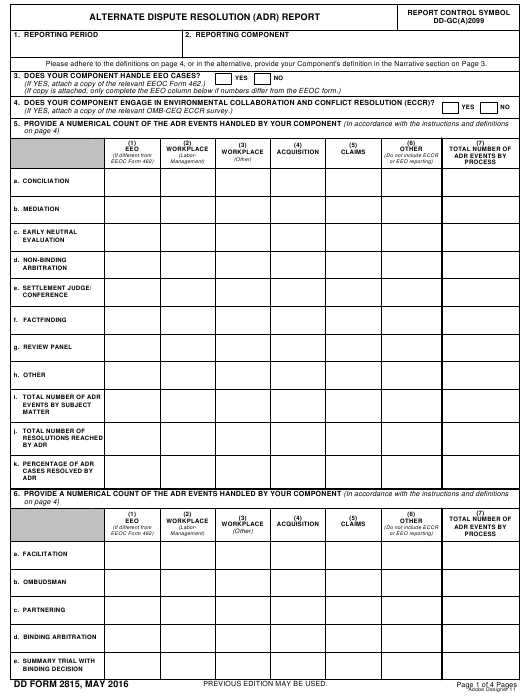 DD Form 2815 - also known as the "Alternate Dispute Resolution (adr) Report" - is a United States Military form issued by the Department of Defense. The form - often incorrectly referred to as the DA form 2815 - was last revised on May 1, 2016. Download an up-to-date fillable PDF version of the DD 2815 below or request a copy through the chain of command. Include NAME, title and POC information for your Component's Dispute Resolution Specialist, ADR Program Manager, and working points of contact. related to encouraging increased consideration and/or use of ADR, other. Do not include personnel changes. Include any intentional efforts to expand the use of ADR in specific subject matters, at specific stages of disputes, or using specific ADR methods. Describe notable successes in the use of ADR and key lessons learned as a result. Provide other information as appropriate, including any definition you applied to your reporting data that differs from that described above. the attempted resolution of a given dispute, report each as a separate ADR event. Acquisition. Include ASBCA appeals, bid protests (agency and GAO), contract claims, and federal court cases. professional using one of the ADR methods to work towards resolution. medical-related and other claims against the Government. clarifying perceptions, and pointing out misperceptions. This process often is used prior to other ADR processes, such as facilitation and mediation. by Ombuds (in which case it should be identified at page 1) or other personnel (in which case it should be a part of the narratives discussed on page 3). EEO. Complete this column only if your ADR program numbers differ from those reported on the EEOC Form 462.
use of an ADR neutral has become necessary. order to determine what the “facts” are in a dispute. parties make the decision themselves. separate ADR action or event. Narrative section other areas where ADR was used in your Component. improve project performance and preserve long term relationships. Review Panel. A problem-solving process where a dispute is presented to a group or panel for a decision before it becomes a formal complaint. a summary presentation to an administrative judge who renders a binding decision. Total Number of ADR Events by Process. This number should be the sum of all numbers in the row. practices (ULPs), impasses, negotiability disputes and other undefined disputes addressed in a labor-management context. and management or between two or more employees.